Why Our 3 Degree-of-Freedom (3DOF) Motion Platform? For the most effective training and skills transfer, experts agree that a simulator needs visual, auditory and motion accuracy. Motion provides life-like cues to the operator, maintains interest for longer and increases experienced operator acceptance of simulation training. Immersive Technologies analyzed and selected a 3DOF motion platform as the most suitable system for the simulation of mining and earth-moving machines based on its high level of safety, training effectiveness and reliability. The amount of motion required in a simulation is dependent on the required training objectives and the machinery being simulated. Operators need to be able to feel realistic motion cues that confirm they are operating correctly or that they need to adjust their operation. These cues help to train muscle memory and better transfer correct behaviours to the real-world. A 3DOF motion platform can roll, heave and pitch. Our experience has shown that more complex 6DOF motion platforms yield no additional training value, introducing significant safety hazards and considerably greater ongoing costs. Immersive Technologies has been working in mining simulation for over 25 years and over that time has determined that 3DOF is the right amount of motion for training mining operators. A simulation training tool needs to be accurate for knowledge transfer to occur; however, it must be complemented by the knowledge and expertise of an experienced trainer to be truly effective. A 3DOF motion platform allows a trainer to stand beside the motion platform and safely provide coaching and guidance to an operator. The inclusion of surge, sway or yaw movements conducted by a 6DOF motion platform eliminate the option for a trainer to stand immediately beside or behind the trainee, due to the risk of serious injury. On a 3DOF motion platform with concealed, underneath-mounted actuators, a trainer can provide close guidance to the operator without being concerned about being knocked or hit. It is critical that any simulator is safe for the operators, trainers and service personnel. A key factor in this is the safety of the motion platform. Our 3DOF motion platform takes safety into consideration at every level and is designed to provide peace of mind. Three emergency stop buttons ensure there is always one within easy reach should the motion platform need to be stopped quickly for any reason. Our 3DOF motion platform houses all actuators and other moving mechanical components underneath the upper moving frame (as opposed to floor mounted beside the moving frame). This allows trainers and operators to safely move around the platform without floor obstructions, both during training activities and while changing Conversion Kits®*. A 3DOF motion platform with actuators underneath the platform allows all moving parts to be hidden behind a protective cover to keep hands and feet away and prevent crushing and pinching hazards. Our motion platform has a protective cover running all the way around the platform and will not operate if this cover has been removed. 3DOF motion platforms are generally lower than 6DOF platforms. 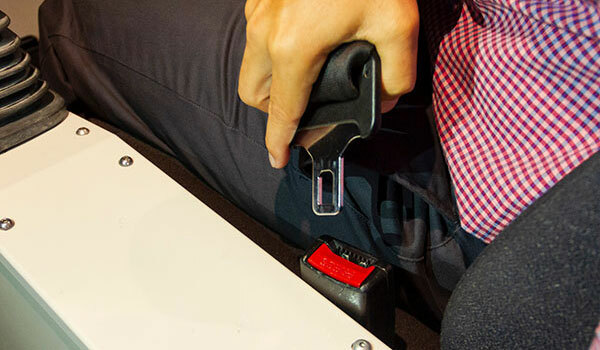 Our motion platform has a low profile allowing an operator to safely get into and out of the seat. The motion platform always begins and ends a training session at a low resting position to ensure the operator has the smallest step possible when transitioning on and off the simulator. An operator should always wear a seat belt when on a motion platform. Our motion platform will not move until the operator has fastened their seat belt. Once they are safely seated with the seat belt fastened, the motion platform moves upward into the mid-range position ready for simulation. Should the operator remove their seat belt during simulation then the motion base will immediately move back to the low resting position and stop. Changing Conversion Kits requires trainers to perform manual handling to replace each of the consoles on the motion platform to transition the simulator from one machine to another. Our motion platforms can be rotated (on the PRO4) or moved around on wheels (IM360) to position the platform in the best position for safe manual handling of each console. Locking pins or adjustable stands ensure the motion platform cannot move during operation once the Conversion Kit changeover is complete. Mining simulators operate in remote locations and as a result reliability is crucial. A motion platform is a key contributor to effective training and needs to be running whenever training is being performed. Our 3DOF motion platform has been designed for reliability and dependability through quality parts, a low component count and years of verification in the field. Our Electro-Mechanical 3DOF Motion Platform was released in 2010 and since then has been deployed in over 200 simulators worldwide. Our motion platforms are in operation all over the world in every condition imaginable including high altitude, extreme cold and heat, high humidity and excessive dust. Together our deployed motion platforms have been in operation for over 900 years and have proven to be highly reliable, dependable and safe. For quality and reliability in a motion platform, only the best parts should be used. Bosch Rexroth set the standard for reliability and performance in the industry. Our motion platform uses high quality Bosch Rexroth actuators to ensure reliability, efficiency and safety. A 3DOF motion platform has a much lower component count than a 6DOF platform ensuring it requires minimal servicing and maintenance. In addition, the range of movement on a 3DOF motion platform allows a protective cover to be fitted to keep dust away from all moving parts. Our motion platform has a protective cover running all the way around the platform covering all moving parts. In addition, all electronics and drives are located in a locked cabinet away from the training area, further minimizing dust ingress.